Hyperthyroidism in cats is usually caused by excessive levels of circulating thyroxine, or T4, in the blood. It is the most common type of glandular disorder in felines and affects all breeds. It primarily affects middle-aged and older cats. The average age of onset is 13 years. Male and female cats are equally likely to develop hyperthyroidism. Hyperthyroidism in cats causes a variety of symptoms, but most cats experience an increase in appetite coupled with weight loss. 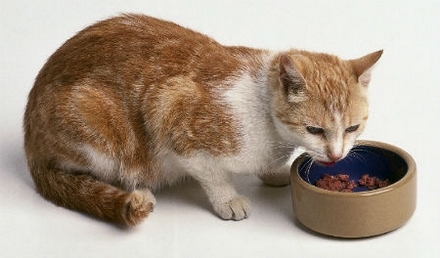 In fact, as many as 98 percent of cats affected by hyperthyroidism lose weight, even though they’re most likely actually eating an increased amount of food. Other symptoms of the disorder include increased thirst and urination, panting, unkempt appearance, shedding, hyperactivity, and vomiting. Diagnosing hyperthyroidism in older cats is challenging because many other diseases common in aging cats, such as diabetes and kidney failure, cause similar symptoms. If your veterinarian believes your cat may have hyperthyroidism, he will likely order a complete blood count, urinalysis, and chemistry panel to rule out other causes of your cat's symptoms. Depending on the results of blood and urine testing, your veterinarian will confirm the diagnosis with a blood test that shows the levels of T4 in your cat's blood. Because some cats with hyperthyroidism initially test negative for the disorder, some veterinarians will repeat the test after a few weeks or months. Treatment generally involves an oral cat medication, such as Methimazole, but some cats suffer severe side effects while taking medication and must discontinue therapy. Cats that tolerate the medication typically see a rapid improvement in their condition. Unfortunately, hyperthyroidism medications require life-long administration. Cats that fail to respond to medication or cannot use it due to side effects or other reasons may benefit from surgical removal of the thyroid gland. Surgery is usually fully effective, but it can be dangerous for older or weakcats. Radioactive iodine therapy, which involves a single injection of radioactive iodine, destroys the thyroid gland to correct the disorder. It effectively cures hyperthyroidism in 95 percent of cases, according to Cornell University College of Veterinary Medicine. This treatment option is expensive, however, and it may involve days or weeks of hospitalization.